Maria Costello is to become President of the TT Riders Association, the latest in a long line of racing legends all, of course, men. So history has been made and she will “ride in” at the annual TTRA lunch on November 7. “I’m honoured to become the first female to become the president of the TTRA. They are a fantastic charity and one that needs to be better recognised for all they do for TT riders and their families,” she said. Another first was scored when 21 year old Spaniard Ana Carrasco won the 2018 Supersport 300 World Championship at Magny Cours after eight rounds battling against the best young blokes Europe could offer. Both are great achievements but women have still to make the break through in motorcycle racing that many think they should, if given the right opportunity. Therein lies the rub. The TT authorities once took the view that women were not strong enough and in the early sixties Beryl Swain was discouraged from riding even a 50cc Itom! 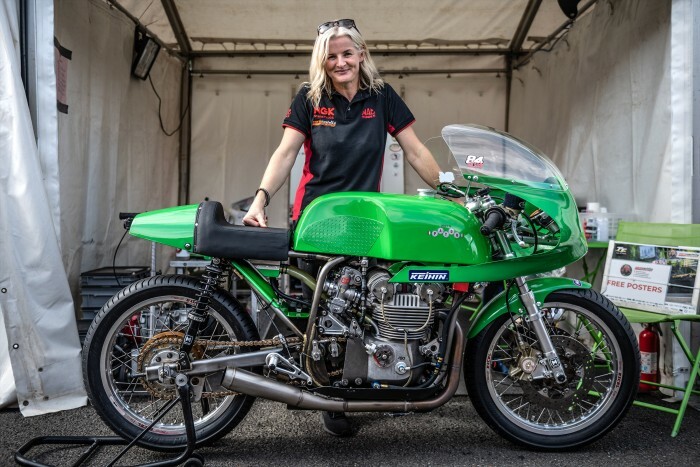 Even now, although views have changed and Costello has mounted the TT podium a number of times, there are those who think she is not strong enough to handle a Superbike on the Mountain Course. Well, there are physical limits but she would argue:“What about Dani Pedrosa then?” And Jenny Tinmouth, who has competed in BSB, holds the female lap record at 119.945mph. Not bad. Maria, awarded the MBE in 2009, is a great ambassador for motor cycle sport, still competing and including sidecar racing in her repertoire, and will receive enthusiastic applause when she mounts the podium at the National Motorcycle Museum to take up her new duties. But as women are gaining more prominence in sport, even physical activity like rugby, motor sport still lags behind. This is not forgetting off road events where Britain has FIM world champions. Although it is easy to forget because they receive minimal attention. Even four wheel sport bemoans its failure to get women behind the wheel. Fewer drive single seater racing cars than ten years ago and it is 40 years since a female driver last started a Formula 1 race. Perhaps that is not entirely surprising as it is estimated to cost £8m to get a junior from karting to be even considered for an F1 drive! A group of people, including former F1 star David Coulthard, have decided, on the basis that women can compete on equal terms with men if given right opportunity, that something has to be done. The Wseries has been launched for 2019 and will run alongside the German DTM series at eight events in Europe including Brands Hatch. Twenty female drivers will be selected and they will race F3 cars, with four cylinder turbo-charged engines producing about 250bhp. This being car racing the winning team will get somewhere in the region of half a million quid. The idea of a women only series has not gone down well in all quarters and social media has, in general, been scornful of the idea on the basis that if women want to be equal why can’t they compete with men!? This is the view of Maria Costello who has consistently argued that, given the right opportunity, she and others can. The argument is that after many years of that “right opportunity” not presenting itself this is a route for successful competitors to do just that. Whatever is the right way forward, you can bet that Maria Costello will do everything from her new platform to plug her mission to get more women on the track.